After four seasons headlining the CW’s “Nikita,” Maggie Q — who was then the only Asian American to star in a network show — returned Wednesday in CBS’ new drama “Stalker.” She’s Lt. Beth Davis of the LAPD’s special unit that goes after stalkers week after week (I know, I don’t know how long it’ll take before that formula begins to wear thin; in the pilot, there were two stalker plotlines, so they really poured it on). She reluctantly hires former New York detective Jack Larsen (Dylan McDermott). When you watch the first episode (at least, the version CBS pre-screened for select community members last month), it seems as if this is Q’s show. After all, she begins narrating her own story, talking about her stalker unit and spouting off statistics about how many people are affected by this growing phenomenon, etc. In trailers, her name came first, followed by McDermott’s. Unfortunately, due to some behind-the-scenes maneuvering, I’m told that in the broadcast version, McDermott’s name will come first ahead of Q’s. Strange, being that last fall, McDermott co-starred in the network’s much-publicized “Hostages,” a well-conceived show that nevertheless, week after week, couldn’t average more than a 1.5 rating in the 18-49 age group favored by advertisers. It was clear it wouldn’t make it to a second season (it didn’t). Yet he gets to try again and this time graduates to the first name in the credits? Compared to Q, who top-lined a series (albeit on a smaller network) for four straight years? “Stalker” airs Wednesday nights on CBS. 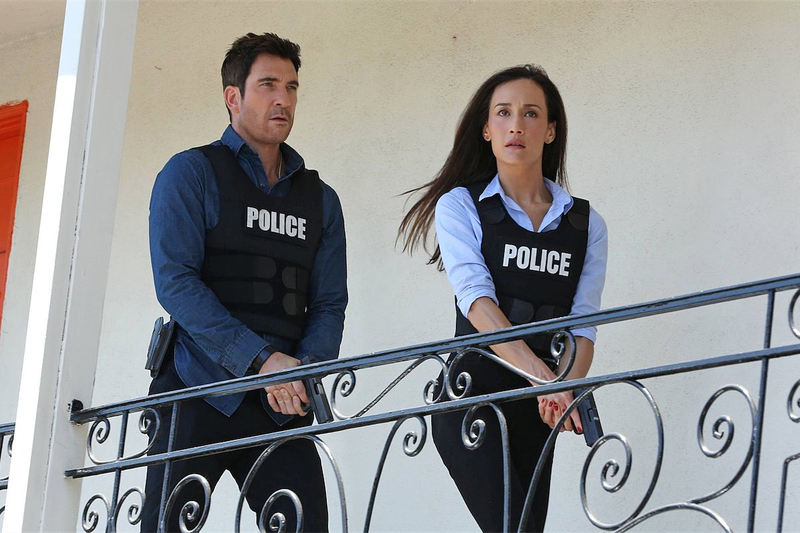 CBS’ “Stalker”: Who’s the real star of this show anyway? What? What’s That You Say? 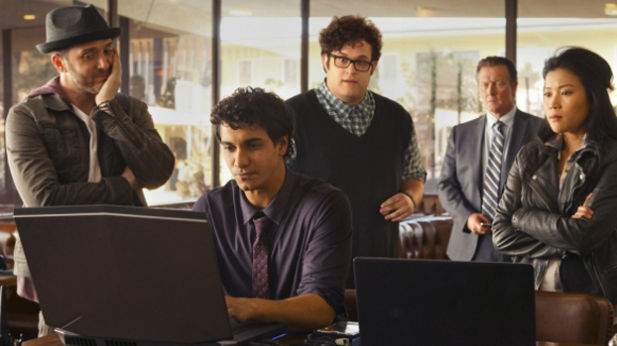 Department: The premiere episode of CBS’ “Scorpion” — directed by executive producer Justin Lin — did well last week, attracting 14 million viewers with a 3.2 rating with those between 18 and 49 (it also held surprisingly well this week, remaining above 13.3 million and slipping to just a 3.0). It was fast-paced, and utilizing skills honed from shooting four “Fast and Furious” movies, Lin produced a “how the hell did they do that? !” sequence where the two stars of the drama (Eleyes Gabel and Katherine McPhee), driving a speeding jeep, kept pace with an airliner just above them so they could physically hook up their computer with a pilot standing on the wing to get an Internet signal for 7 seconds. Huh? Outlandish, over the top, but fun to watch. But one annoying aspect of the pilot was the casting of regular Jadyn Wong, who plays a mechanical expert: I could barely understand anything she said. In fact, the first phrase I remember making out was her uttering, “I hate you!” Yeah, well, the feeling’s mutual. Since her speech slowed down somewhat this week, I tried to analyze what makes her so indecipherable and annoying. The actress seems to chew her mouth as she talks, and her pitch is akin to that of Bart Simpson. It’s like how I felt watching the two British agents of “Marvel’s Agents of S.H.I.E.L.D.” last season — when viewers can’t understand what they say, why did you bother hiring them? To piss off non-Brits? To test our ability to bend our brain toward understanding an accent? To appreciate when someone with an American accent comes along and saves us from further torture? Sorry, I’m not a masochist. Quite frankly, if Wong can’t articulate without chewing her words, I wish CBS would replace her with another Asian American. Heck, replace her with two. Scorpion is supposed to be a team of the smartest people on the planet. What, and only one of them was Asian? Pfft! On Second Thought Department: Turns out the broadcast version of the pilot for “Selfie” starring Karen Gillan and John Cho was slightly modified from the online version made available a few weeks before its official airing this Tuesday. 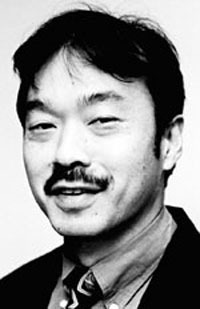 In the latter, the episode ended with a reconciliation between the two stars with Cho slipping and falling in a romantic rain scene after Gillan comes to apologize for insulting him. In the former, “official” version, there’s no slippin’ and slidin’, just two people sitting side by side, slowly accepting each other’s apologies and agreeing to continue to work together. I guess ABC wanted to take this a bit slower than originally. After all, if the two fall for each other within the first episode, what’s left for them to do but bicker in the next just to keep them emotionally apart so that their relationship is not a done deal and therefore, has nowhere to go but boring? Ratings Sweepstakes Department: And they’re off! With new and returning shows gradually appearing on the fall line-up, we’re beginning to see how everything’s stacking up. “The Mindy Project” returned for its third season with a 1.3 rating among the 18-49 age group, falling to a weak 1.0 in the second week. When it debuted last year hot off the momentum of the second “Avengers” movie, “Marvel’s Agents of S.H.I.E.L.D” got 12 million viewers and a whopping 4.6 rating for viewers under 50, but the directionless action show lost viewers for six consecutive weeks. When it finally found its legs by continuing plot lines following the second “Captain America” film, enough people had given up on the show, and the numbers never came back. Its season finale could only muster 5.45 million people and a 2.0 rating. Last week, the first episode of the second season fell even more to a lackluster 1.9 rating. It’s actually interesting now, and I’m looking forward to finally finding out the identity of Skye’s parents. Since actress Chloe Bennet is half Chinese, I’m hoping that’s exactly what her character will turn out to be on the show. We already know her dad is played by Kyle McLachlan. The fifth-season opener of “Hawaii Five-O” registered a 1.3 rating, which was down from its 1.6 rating a year ago. Previews for next week’s show indicate the team has to rescue a kidnapped girl. Guess her race. Is she Asian? Local? Of course not, silly! Everyone who’s been reading this column for the past four years knows the producers only want you to care about white people. So they’re the ones that are going to be rescued. Oh, and they made her blonde to really push it. It’s funny because in the past, Asian American activists hated AA characters being victims needing to be rescued by white people. Hell, in the case of this show, it would actually be an improvement. Because then we’d be worth caring about. It would balance out brown, local-looking faces turning up mostly in mug shots then dead before uttering a single line.